Johnny Guerrero (Dantes) is a guy on the mean streets of the Philippines who tries to control his drug territory by night and plays basketball with his team the Slumboys during the day. When his rival Ricky has him shot, Johnny goes to his grandfather’s house in the countryside to recuperate. While there, the old master teaches him the ways of Arnis, or Stickfighting. After some rigorous training in this deadly art, Johnny turns his life around and becomes a police officer. He even brandishes a special weapon, a metal, unfoldable stick, much like a baton. His passion for stickfighting continues after he finishes his convalescence and enters the force, and he starts not only the first stickfighting training classes in the academy, which prove to be extremely popular, but also inaugurates a large stickfighting competition. Under Johnny, stickfighting goes from being practiced only in “the sticks” (heh heh) to becoming huge. They have a character arc all their own. Of course, Johnny faces many obstacles along the way, and his quest for revenge against Ricky still burns, especially since Ricky killed Johnny’s father long ago. Also, his new girlfriend, Vicky Lopez, has a father that doesn’t approve of him. Can Johnny use his expertise in stickery to win the day? One of the best things about Sticks of Death is the dubbing. Presumably, since it’s being dubbed in English for an English-speaking audience, you’d think that whoever dubbed it wouldn’t have incredibly thick accents. One would believe they would get some native English speakers to dub the film. Crazy, I know. But the stilted dialogue and awkward syntax is really, really funny, so it all works out. The poverty of where they shot the movie is emphasized, and it’s no surprise stickfighting was big, as it is certainly a rural weapon. No technology needed. All you’ve got to have is sticks. And some skill of course. Our main man Roland Dantes based much of his career on stickfighting, as there is the movie under review today, another one called Stick Fighter, and he plays the stickfighting guy in Ron Marchini's Forgotten Warrior (1986). Apparently he also turns up in Under The Gun (1995), after he moved from the Philippines to Australia. Dantes has probably done more than any other to spread the knowledge of stickfighting around the world, and he should be recognized for that. 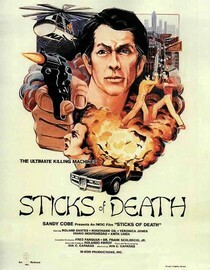 Also it’s great how the filmmakers try to show that the sticks (of death) are far superior to any weapon, including guns. If someone breaks out a gun, Johnny just raps them on the wrist with his sticks and the gun goes flying. Much like The Wiz, nobody beats the sticks. Sadly, this was director Ave Caparas’ only directorial effort. It’s an example of true Filipino DIY filmmaking, shot on the streets with many non-actors, and filled with the smash-cuts and other rough-and-tumble qualities that come with the territory. It can be compared in this regard to Search for Vengeance (1984), among other examples. Though it was released in 1984, the whole film has a very seventies vibe, with great outfits, mustaches, and notable music, including a live disco band (is it the same one from Revenge of the Bushido Blade?) that does a pretty smokin’ eight-minute version of “Dancing in the Moonlight” that you won’t soon forget. The other music was done by Jun Francisco. Much like a McDonald’s Happy Meal toy from your childhood, Sticks of Death is cheap but fun and provides a lot of winning entertainment against all odds. Awesome review, guys. I've been looking for this film for a long time and haven't found much outside of some YouTube clips. Dantes is the man and IIRC, he had a brief arnis fight with an unarmed Trimble in Live By the Fist toward the back-end. There's also a short arnis (aka escrima) sequence in the Leo Fong movie Ninja Assassins when his character is training/recuperating after his prison stay. His sparring partner in that scene was Angel Cabales, an escrima master. Stickfighting is definitely an overlooked onscreen martial art, especially in the West, and it's cool to see you guys spotlight it here. There has to be more out there but deep-diving into Filipino 80s action is an arduous process. The McDonald's Happy Meal analogy sold it for me. Karl: Thanks! Got to watch Live By The Fist again and totally forgot about the sequence in Ninja Assassins! There is another movie with Roland called Stickfighter, we are trying to look for a copy. DTVC: Would definitely be interested in your opinion! We watched it on Netflix Instant. This is a great movie. A lot of Filippino stuff is pretty rough going at times, but Sticks of Death was fun all the way through. As of right now, it's streaming on Netflix. Totally agree with you, Goodkind! Wow, I'm a big fan of trashy Filipino action and this looks the goods. Great review Ty, I'll have to track this down. Thanks Sutekh! Would definitely be interested in your take on it. Hey it's on Netflix! On the instant viewing. I agree that this movie really seems like it was made in the 1970s, and not the 80s. I have a VHS copy of StickFighter, which is a million times better, with Dantes and US actors Dean Stockwell, Gilbert Roland, Alejandro Rey and Nancy Kwan. It takes place in the Spanish Colonial days, which is an unusual setting for a Filipino action movie. Stick Fighter looks pretty cool! Hope to find a copy soon. Didn't know it took place in Spanish Colonial times. You're right, that is odd. I practically grew up in Frank Santini's house in Santa Rosa. Little known fact. Vicky Lopez is Franks real daughter. I always wondered about this movie an finally got to watch it. Interesting comment. Thanks for the info.